Concert season is soon approaching (for me it starts next month with two concerts one after the other!) 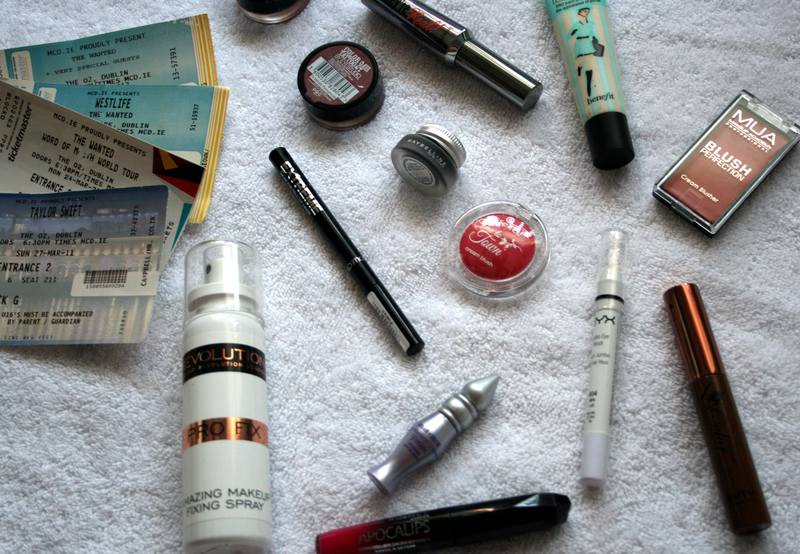 and I will admit I put a lot of products on my face and normally get dressed up because why not!? One thing I have learnt through attending concerts for years is how to get makeup to stay on my face throughout the concert when it gets really warm! Yes some things will fade and you can't do much to stop that because of the heat but I have learnt a few things to help keep your makeup looking decent even when the show is over! Eyes also need a good base and personally my favorite is the Urban Decay Primer Potion, out of all the eye primers I've tried I just find this one the best at keeping your eye makeup looking fresh all day long. Sometimes I decide that I want to do some vibrant eye makeup and so I use a base that helps the colours pop. For this I use the NYX Jumbo Pencil in Milk this is also a great base and keeps your shadows in place all day long! For brows I'd recommend setting them with a brow mascara, whether it be a clear gel or a coloured one this helps them last so much longer! My favourite at the moment is the TuTu Colour My Brows* which you can read all about here if you'd like. Onto eyeshadows, as much as I adore all my pigment/powder eyeshadows when it comes to a concert being realistic a cream eyeshadow is going to last much much longer! I have only started a while back using cream eyeshadows and they are amazing and do not budge! My favourite at the moment are the Maybelline Colour Tattoo's they come in a range of colours including crazy vibrant fun colours, so there is something for everyone. 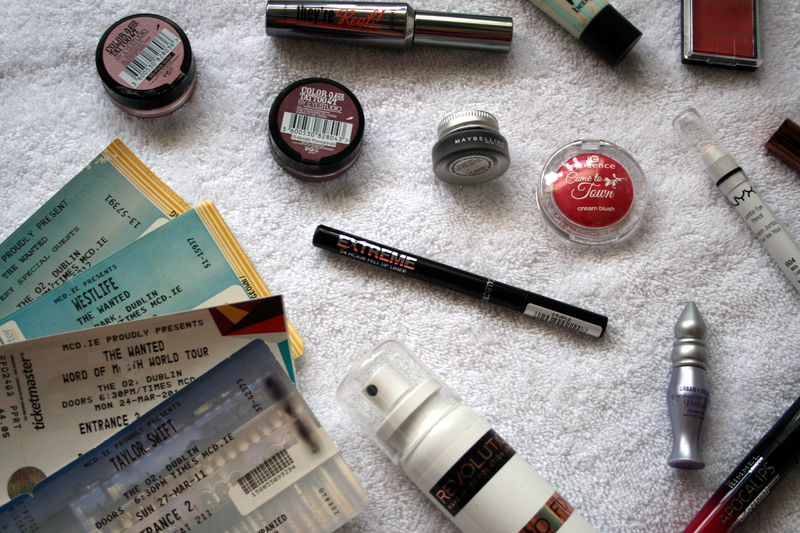 Personally when it comes to concert makeup and blusher I skip it. When it's warm which it does be my cheeks are (sadly) naturally rosy so if I put blush on on top of that it looks like I went overboard with the blusher! However a light sweep of your favourite powder (Benefit Rockateur for me) or cream blush (MUA in Yummy or Essence Santa Is That You) should last you for the night. It's going to be warm and your cheeks will get somewhat red so a light sweep! For mascara and liner I normally opt for waterproof just to be on the safe side! Mascara wise I use my holy grail also known as Benefit They're Real and for eyeliner I use my favourite Maybelline 24hr Lasting Drama Gel Liner. As I've used both of these for years and have worn them in rain,snow and other concerts I know they'll stay in tact all night long. Finally for some long lasting lip colour. If you're having a beverage during the concert you want something on your lips that you don't have to worry about. My favourite lip product to wear are the Rimmel Apocalips as they stay on your lips no matter what! They have a huge colour range and even a matte option so more than likely they have a colour you're looking for! To tie the look all together I normally finish with some setting spray. The one I've been loving is the Makeup Revolution Pro Fix Makeup Setting Spray. Another thing I do with this product is I actually spray this on my Real Techniques Complexion sponge to dampen it instead of using water. I find that it just gives your foundation and concealer a little more extra help at lasting that little bit longer. Are you going to any Concerts soon?